Scan today went swimmingly. The baby has grown from estimated weight of 2.65kg a couple of weeks ago to 3.16kg today. 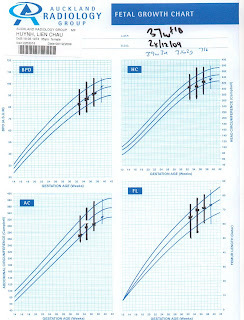 This is such good news as we have been monitoring the baby's growth since it was a little on the small side. I am very pleased with myself for keeping up with eating every 2-3 hours. This has been a very difficult exercise since that constant feeling of fullness is so overwhelming, and the heart burn doesn't help with the appetite either. So the baby has dropped and now in a good position to go into labour. All that needs to happen now is to actually go into labour!